After being inspired by the latest Apple-Samsung lawsuit, Pattu Maami from Mylapore has taken an apple leaf out of Tim Cook's book to file a lawsuit on the famous chocolate manufacturer, The Hershey Company. She claims that the design of Hershey's Kisses, one of the famous products of the company, is blatantly copied from the design of Kozhakattai - a dish made on Vinayaga Chathurthi for Lord Ganesh but mercilessly eaten by human beings in the lord's name. On close observation, one can note the similarities between the two designs and it is surprising that none of the yesteryear maamis observed this conspicuous similarity in the design. Hershey's kisses have been in production from 1907 and the company has made a profit of at least $100 trillion dollars from the product. "I expect a compensation of $100 trillion dollars," she said, in a vehement manner, and added "I have been kind enough to ignore the effect of inflation in the calculation." If the case is successful, this will become one of the biggest lawsuit in the history of pointless lawsuits, thus putting the Apple-Samsung case to shame. Pattu Maami's case is strong but it has opposition from several maamis across the neighborhood, who claim that the Kozhakattai's design belongs to their own ancestors. 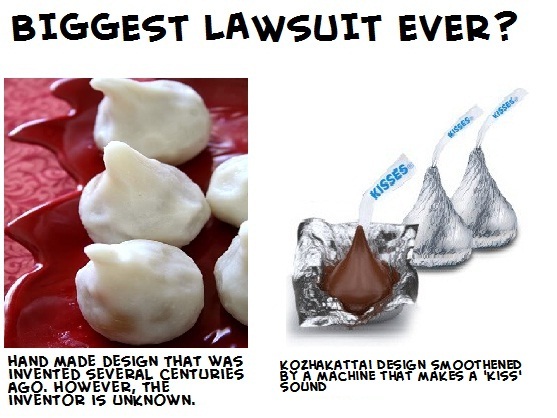 To resolve this issue, a Kozhakattai making competition is expected to take place tomorrow to determine the design that closely resembles the Hershey's kisses. However, Venu Shaastrigal [name changed on request] of Kapaleeshwarar Temple is unhappy with the trivial pursuit of trillion dollars by the Mylapore Maamis. "None of us can claim the Kozhakattai's design for ourselves. It belongs to Lord Vinayaga himself. While I am not totally against the lawsuit, I feel that the money should come to the Kapaleeshwarar temple as a token of appreciation for Lord Siva for giving birth to Lord Vinayaga," he said thoughtfully while slyly asking for donation for the temple. He also said, "I believe the money will be sent in twenty trucks containing several thousand coins. The temple's Hundial can handle such volumes easily." Recent developments have indicated that the Hershey Company will not to give up without a fight. The company's lawyers have come up with a bizarre defense, which is inspired by Samsung's defense, in which Samsung claimed the tablet was invented by Stanley Kubric in 2001: A Space Odyssey. 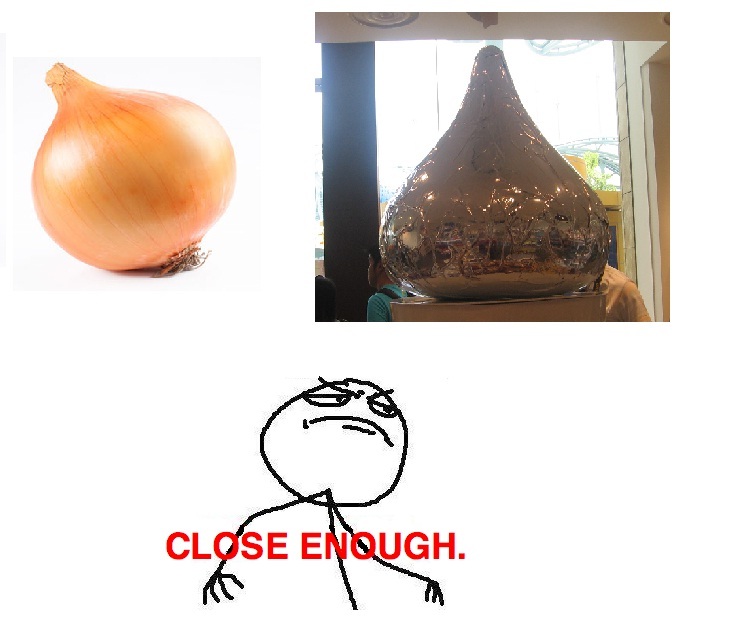 "Both Kozhakattai and Hershey's kisses have been copied from the design of an onion," the lawyers said triumphantly and then corrected, "rather a miniature version of the onion." This defense has opened an opportunity for people to lay claim for the design of the onion, which has been in existence from the Neolithic era. This is just the beginning of a saga that might shock everyone in this world. Yappa :D I am going to file a lawsuit against you for my stomach pain!!! Laughing still!!! An excellent one :) Superb one!! !